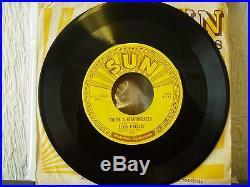 MILKCOW BLUE BOOGIE ORIGINAL SUN 45 215 ELVIS PRESLEY. 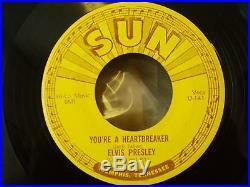 THIS IS THE 3RD EVER ELVIS RECORD RELEASED IN THE WORLD AND IS THE RAREST OF THE 5 SUN RECORDS. 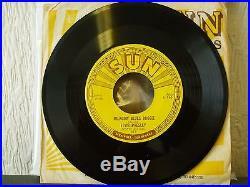 THIS IS A GENUINE ELVIS SUN 45 - THE 3 PUSH OUTS CAN BE CLEARLY SEEN AND FELT ON BOTH SIDES. THE RED MARKINGS ON THE "MILKCOW" SIDE ACROSS THE SUN LOGO WHERE CLEARLY MARKED ON THEIR SALE PHOTO. WHAT THIS MARK IS I DO NOT KNOW. PRESSING FAULT WITH SOME DYE RUN? THAT APART THE LABELS ARE STUNNING. CRISP BRIGHT AND VERY CLEAN. THE RECORD IS VIRTUALLY MINT. IT IS STUNNING THE SHINE AND GLOSS ON BOTH SIDES IS BEAUTIFUL. THE "MILKCOW" SIDE HAS JUST SOME TINY TINY MARKS / SCUFFS / VERY LIGHT PAPER BAG TYPE MARKS. THEY ARE SO TINY YOU HAVE TO LOOK A WHILE TO SEE THEM. OTHER SIDE HAS A FEW VERY SMALL SCRATCHES ON IT. IT IS EX ++ EASILY. THE RUN OUT MARKINGS ARE U -140 - 45 WITH THE 2 OF THE 72 ABOUT 1 CENTIMETRE FROM THE 5 IN 45. OTHER SIDE IS U - 141 - 45 72. AGAIN 1 CENTIMETRE APART TO THE EDGE OF THE 2. THIS IS AS CLOSE TO A MINT COPY AS YOU COULD EVER SEE AND WOULD BE HARD PUSHED TO FIND A BETTER ONE. ANY QUESTIONS PLEASE FEEL FREE TO ASK. YOU WILL HAVE TO PAY THEIR CHARGES. THANK YOU FOR LOOKING AND PLEASE LOOK AT MY OTHER RARE ELVIS ITEMS. 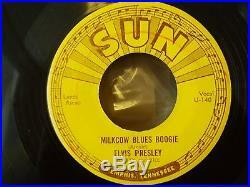 The item "MILKCOW BLUES BOOGIE SUN 215 ELVIS PRESLEY 45 ORIGINAL IN NEAR MINT WOW" is in sale since Saturday, February 20, 2016. This item is in the category "Music\Records\7'' Singles\Rock\Elvis". The seller is "2275dean" and is located in Hull. This item can be shipped to United Kingdom, to Austria, to Belgium, BG, HR, CY, CZ, DK, FI, to France, to Germany, GR, HU, to Ireland, to Italy, LT, LU, MT, to Netherlands, PL, PT, RO, SK, SI, to Spain, SE, to Australia, to United States, RU, to Canada, to Japan, to New Zealand, to China, IL, to Hong Kong, NO, ID, MY, to Mexico, SG, KR, to Switzerland, to Taiwan, TH, TR.